A chemical bond results from strong electrostatic interactions between two atoms. The nature of the atoms determines the kind of bond. For example, consider a hydrogen molecule, H2. 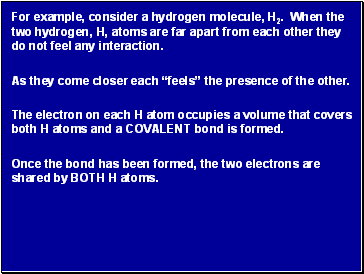 When the two hydrogen, H, atoms are far apart from each other they do not feel any interaction. As they come closer each “feels” the presence of the other. 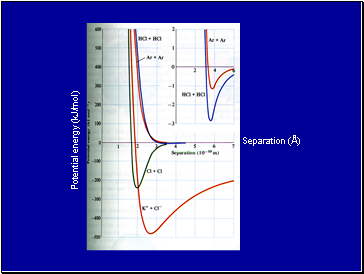 The electron on each H atom occupies a volume that covers both H atoms and a COVALENT bond is formed. 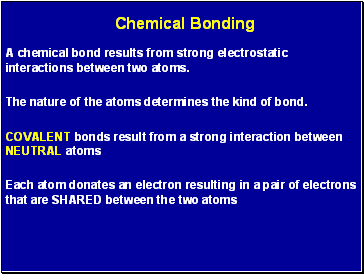 Once the bond has been formed, the two electrons are shared by BOTH H atoms. 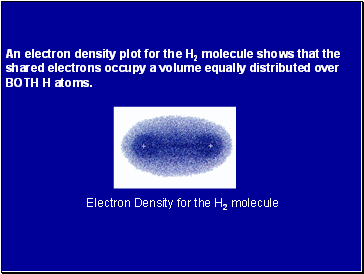 An electron density plot for the H2 molecule shows that the shared electrons occupy a volume equally distributed over BOTH H atoms. It is also possible that, as two atoms come closer, one electron is transferred to the other atom. The atom that gives up an electron acquires a +1 charge and the other atom, which accepts the electron acquires a –1 charge. 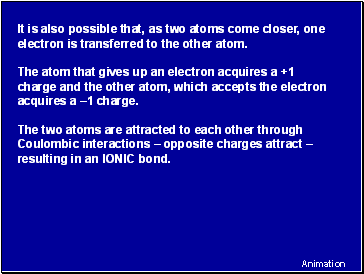 The two atoms are attracted to each other through Coulombic interactions – opposite charges attract – resulting in an IONIC bond. 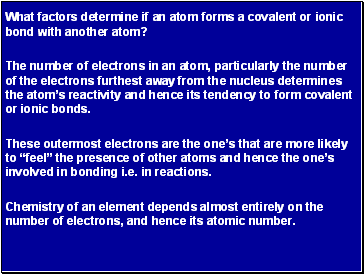 What factors determine if an atom forms a covalent or ionic bond with another atom? The number of electrons in an atom, particularly the number of the electrons furthest away from the nucleus determines the atom’s reactivity and hence its tendency to form covalent or ionic bonds. 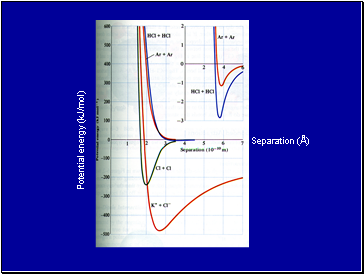 These outermost electrons are the one’s that are more likely to “feel” the presence of other atoms and hence the one’s involved in bonding i.e. in reactions. 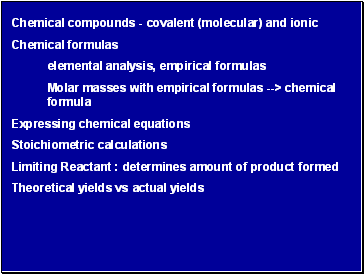 Chemistry of an element depends almost entirely on the number of electrons, and hence its atomic number.